Founded in 1975, specializing in the design and manufacture of process equipment for the municipal, industrial water and wastewater markets. 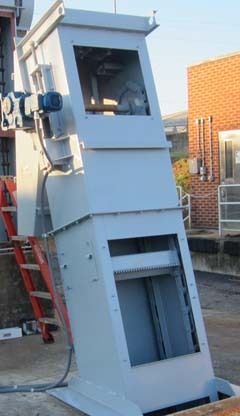 The E&I Catenary Bar Screen is an extra heavy duty front cleaned, front return mechanical bar screen. The screen utilizes two (2) strands of steel chain that is heavier and has superior strength than any other screen chain. Connected between these chains are counter weighted rakes that remove debris trapped on the bar rack. 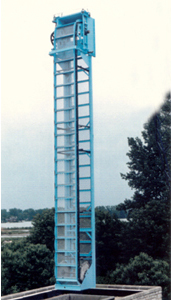 The device is simple yet rugged and consists of two strands of heavy-duty roller-chain which supports mesh baskets. The chain and basket assembly travels over head-shaft sprockets which are equipped with removable hardened teeth. The baskets continue around lower traction wheels, where seal plates maintain close tolerances; this eliminates the pass-through of debris. The EIMT Screen is an all stainless steel, front raked, front return Bar Screen - The yardstick in the industry for sturdy reliability. 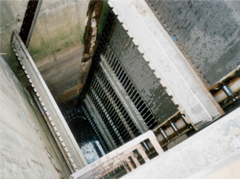 Even in the toughest applications, such as deep channels, high flows and combined sewers with large debris, the EIMT Screen operates trouble-free every day. Rugged craftsmanship reduces capital costs by delivering coarse bar screening durability combined with fine screen separation.